Doctors Say T2 Diabetes Is Reversible! If you are a Type 2 diabetic or if you know someone who is a Type 2 diabetic, it is important to know that there are doctors that now admit that Type 2 diabetes can be managed and possibly reversed with proper diet and exercise and without the need for diabetic medications. Today, more than ever before, there are doctors and other medical experts that agree that Type 2 diabetes can be managed and possibly reversed with proper diet and exercise. However, for legal (and financial) reasons, most medical doctors cannot publicly admit this to their patients or to the public. And, because medical doctors cannot admit this, the majority of patients and the public are unaware that Type 2 diabetes can be managed and possibly reversed without the need for diabetic medications. And, because most of the public is unaware of this, the majority of people with Type 2 diabetes continue to trust their doctors and the drugs, and end up suffering unnecessarily with health issues such as blindness, amputation, and kidney failure. So, I thought that I would put together a list of some of the doctors and various institutions that now state that Type 2 diabetes is controllable and even reversible with diet and exercise. Hopefully, by being aware that there are doctors who agree that reversing Type 2 diabetes is possible, maybe you will be more willing to share this important and life-saving information with your family, friends, co-workers and community. And, if everyone shares this information, there will be less people suffering unnecessarily with the complications of this disease: blindness, amputation, kidney failure/dialysis, infections, erectile dysfunction, high blood pressure, high cholesterol, heart attacks and strokes. Thirty years ago, 0% of all medical doctors believed that Type 2 diabetes could be controlled without medication. Today, almost 14% of all medical doctors believe that Type 2 diabetes can be controlled without medication. In addition, some doctors even believe that Type 2 diabetes can be reversed under the right conditions. However, medical doctors cannot admit this publicly in fear of losing their license. Despite this, the list of medical doctors and experts who believe that Type 2 diabetes can be controlled without medication and even reversed is still growing. 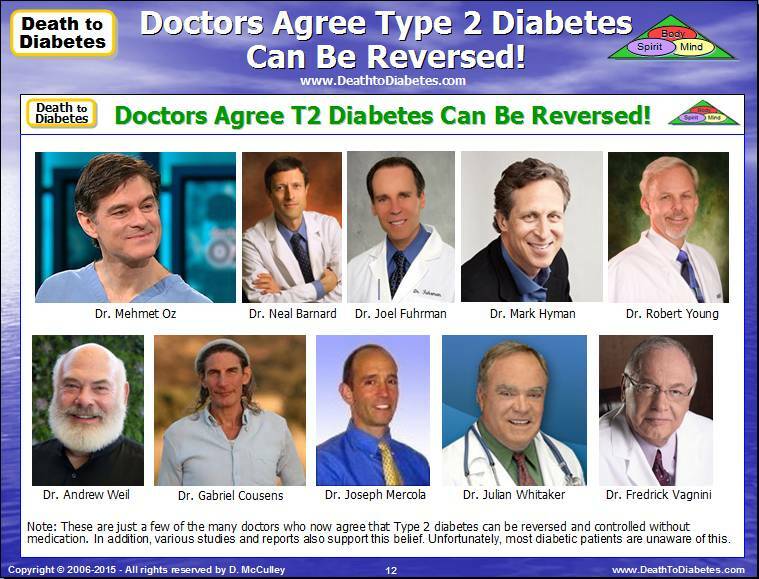 The following diagram shows some of the doctors who agree that Type 2 diabetes is reversible and can be managed with diet and exercise without the need for medication. More Evidence That Type 2 Diabetes Is Reversible The following studies and reports are just a few of the many cases that demonstrate that Type 2 diabetes is reversible in this country and around the world. Can all of these people be wrong? A ground breaking new study in Diabetologia proved that Type 2 diabetes can be reversed through diet changes, and, the study showed, this can happen quickly: in one to eight weeks. Lim EL, Hollingsworth KG, Aribisala BS, Chen MJ, Mathers JC, Taylor R.
Dr. Mehmet Oz says diabetes is reversible. Note: Dr. Oz got into a little trouble with some of his TV show sponsors, so he has had to back off making too many statements about reversing type 2 diabetes, especially on national television (which is controlled to a large extent by the pharmaceutical industry). Gabriel Cousens, M.D., M.D. (H), D.D. (Doctor of Divinity), Diplomate of American Board of Integrative Holistic Medicine, Diplomate Ayurveda is considered a leading live-food medical doctor and spiritual nutrition expert. He is also a psychiatrist, family therapist, Ayurvedic practitioner, homeopath, acupuncturist, medical researcher, ecological leader and bestselling author of books such as: Spiritual Nutrition, Conscious Eating and There Is a Cure for Diabetes. Dr. Cousens has developed the first live-food, vegan Masters' program in the world - in conjunction with University of Integrated Science California. He is the director and founder of the Tree of Life Foundation and the Tree of Life Rejuvenation Center, called by Harper's Magazine, "One of the world's best 10 yoga and detoxification retreats. On the next NaturalNews Talk Hour - a LIVE internet radio program - Dr. Gabriel Cousens will talk about how to REVERSE diabetes in 21 days with his cutting edge program of natural foods and lifestyle interventions. 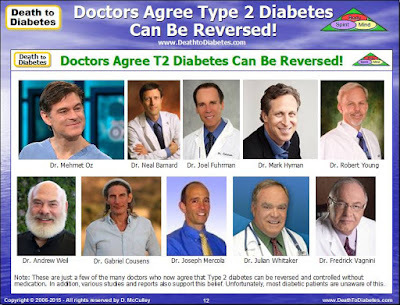 Dr. Gabriel Cousens says that you can reverse your diabetes in 21 days with his cutting edge raw food program of natural foods and lifestyle interventions. Bethesda, Maryland (CNN) -- Diabetes type-2 can be reversed. "We have seen numerous people reverse their condition," says Dr. Michelle Magee, director of the MedStar Diabetes Institute in Washington. "But it takes a real dedication for the rest of their lives," she notes. Researchers from Newcastle University have clearly shown that a strict low calorie diet can actually reverse the condition by normalizing blood glucose levels, reducing cholesterol levels and even stimulate the pancreas’s insulin producing cells (beta cells) to return to normal! However, this was a small-scale study and involved just 11 people; 9 men and 2 women. The full study was published in the June issue of the journal Diabetologia. TYPE-2 DIABETES CAN BE REVERSED? A new study suggests an extreme eight-week diet can reverse Type 2 diabetes in people newly diagnosed with the disease. Researchers at Britain's Newcastle University found the 600 calories-a-day diet reduced fat levels in the pancreas and liver, which helped insulin production return to normal. Seven out of 11 people who went on the diet, eating only liquid diet drinks and non-starchy vegetables, were free of diabetes three months later. But experts say more research is needed to see whether the reversal is permanent. Lead study author Roy Taylor says, "This diet was only used to test the hypothesis that if people lose substantial weight they will lose their diabetes. Although this study involved people diagnosed with diabetes within the last four years, there is potential for people with longer-standing diabetes to turn things around too." Studies have been showing that people with type 2 diabetes who undergo gastric bypass surgeries can - within a matter of days - stop being diabetic. Researchers at the School of Medicine have discovered that type 2 diabetes is at least in part an autoimmune disease. Their report, published in this month’s Nature Medicine, shows that B-cells appear in the inflammation of the visceral fat that precedes diabetes, and controlling them with drugs can actually prevent insulin resistance in mice on high-fat diets. (NaturalNews) The mainstream media is just now catching on to what NaturalNews and other natural health advocates have been saying for years: type 2 diabetes can be reversed through dietary and lifestyle changes, and without the need for lifelong drug interventions. A recent report by CNN says that improving one's diet, keeping off excess weight, and regularly exercising, can help millions of people with diabetes get rid of it for good. Frank B. Hu, M.D., JoAnn E. Manson, M.D., Meir J. Stampfer, M.D., Graham Colditz, M.D., Simin Liu, M.D., Caren G. Solomon, M.D., and Walter C. Willett, M.D. Dr. Mark Hyman says type 2 diabetes is reversible with early intervention and a proper diet. A peer reviewed study demonstrates 11 people (55%) of the patients reversed type 2 diabetes in an average of 16 days. Anderson, J. W., & Ward, K. (1979). High-carbohydrate, high-fiber diets for insulin-treated men with diabetes mellitus. American Journal of Clinical Nutrition, 32, 2312-2321. The abstract is available to the public at this link. Engineer proves diabetes is reversible with plant-based diet. Xerox engineer reversed his diabetes and got off insulin by following a strict plant-based diet of vegetables, legumes, fish, and plant oils. Diabetes is not necessarily a one-way street. Diabetes: Can a Vegan Diet Reverse Diabetes? Early studies suggest that persons with type 2 diabetes can improve and, in some cases, even reverse the disease by switching to an unrefined, vegan diet. This is based on a carefully controlled test performed by PCRM. Working with Georgetown University, PCRM compared two different diets: a high-fiber, low-fat, vegan diet and the more commonly used American Diabetes Association (ADA) diet. Fasting blood sugars decreased 59 percent more in the vegan group than in the ADA group. And, while the vegans needed less medication to control their blood sugars, the ADA group needed just as much medicine as before. The vegans were taking less medicine, but were in better control. Medical research confirms that up to 50% of people with Type 2 diabetes can eliminate diabetes risks and discontinue medication within three weeks by adopting a low-fat, plant food diet and regular daily exercise. Anderson, JW and Ward, K: High Carbohydrate, High fiber diets for insulin-treated men with diabetes mellitus. Am J Clin Nutr, 1979; 32:2312-21. Software executive cures himself of diabetes at the age of 30. Mike Adams, now known as the Health Ranger, cured himself of diabetes in a matter of months and transformed himself into the picture of perfect health in mind, body and spirit. Mike dove into research; he devoured thousands of books on nutrition, pharmaceutical drugs, wellness programs, the politics of food - anything he could find. Mike has now made it his life mission to share the most remarkable discovery he made on his quest: the vast majority of all diseases can be easily prevented and even cured without drugs or surgery. Potentially reversible diabetes conditions include prediabetes — when your blood sugar levels are higher than normal, but not high enough to be classified as diabetes — and gestational diabetes, which occurs during pregnancy. Dr. Mercola: Not only is type 2 diabetes completely preventable, but it is virtually curable for anyone who is willing to put in the hard time and work and recovering their insulin and leptin sensitivity. The Diabetes Conundrum: What Physicians Are Teaching You May be Killing You - Read the surprising conclusion Dr. Rosedale, one of the leading diabetic doctors in the country, reaches about the current state of knowledge in diabetes. The Rosedale diet: The real "cure" for diabetes is to eat a diet that promotes insulin and leptin sensitivity. Natural Treatments For Diabetes: The Whitaker Wellness approach is very effective in reducing and often eliminating the need for oral diabetes drugs and insulin in patients with type 2 diabetes. The Whitaker Wellness Institute’s approach to diabetes is twofold: to lower blood sugar and to reduce the risk of diabetic complications with diet, exercise, and targeted nutritional supplements. "Hundreds of clinical trials demonstrate that diabetes can not only be prevented but actually reversed -- not with drugs but with simple, inexpensive lifestyle measures." WebMD: Can You Reverse Type 2 Diabetes? Learn the lifestyle changes that may help you reverse type 2 diabetes. "If you take obesity out of the picture, your diabetes will improve dramatically," says Osama Hamdy, MD, PhD, the medical director of the Obesity Clinical Program at the Joslin Diabetes Center in Boston. Doctors Agree Type 2 Diabetes is Reversible! In Latin, the word "inflammation" means "Ignite, set alight" and like gasoline, that's exactly what it does to diseases such as heart disease, obesity, Type 2 diabetes, cancer and most autoimmune diseases. A cellular environment of chronic inflammation can increase the risk of developing a major disease and other health problems. 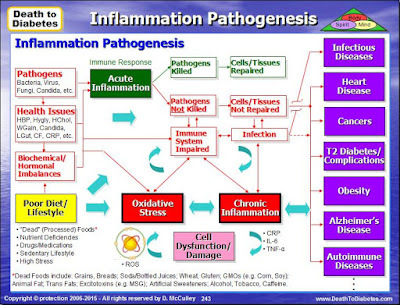 Most importantly, inflammation promotes the ongoing pathogenesis of these diseases, causing major damage to various cells, tissues and organs throughout the body. 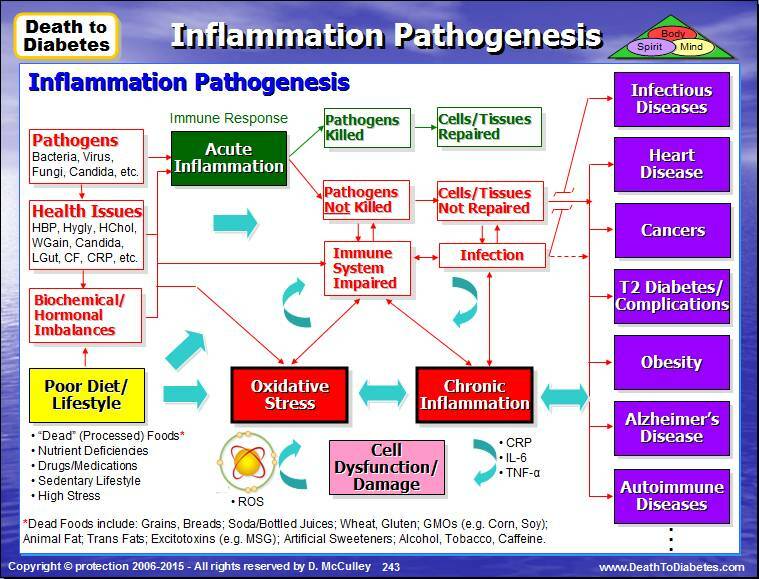 Unfortunately, inflammation and its signaling pathways are ignored by your doctors. Why? Because there is no drug for treating inflammation! But, there are a lot of drugs for high blood pressure, high cholesterol, heart disease, Type 2 diabetes and cancer. So, your doctor waits until you develop one of these health problems or diseases that requires a drug. Uncovering and treating the cause of inflammation, rather than just treating the symptoms, is an important key when preventing any of these chronic diseases. To get to the root of the inflammation, we have to learn what causes inflammation and how to deal with it. Inflammation is the body's response to tissue damage, caused by physical injury, ischemic injury (caused by an insufficient supply of blood to an organ), infection, exposure to toxins or other types of trauma. The body's inflammatory response causes cellular changes and immune responses that result in repair of the damaged tissue and cellular proliferation (growth) at the site of the injured tissue. Inflammation can become chronic if the cause of the inflammation persists or certain control mechanisms in charge of shutting down the process fail. When these inflammatory responses become chronic, cell mutation and proliferation can result, often creating an environment that is conducive to the development of cancer. The so-called "perfect storm" is an extreme challenge that patients face. This is true for the onset of most chronic diseases, but also even more important for advancement of the disease. The disease a patient begins with becomes very different in the later stages, becoming more complex and more difficult to treat. Various signaling pathways are key contributors to creating epigenetic changes on the outside of the cell, switching on these internal mechanisms. Therefore, treating the inflammatory causes is always important. The following diagram depicts how inflammation develops in the human body and can lead to various diseases such as heart disease, cancer and diabetes. Note: You may be wondering why it's so important for us to understand how inflammation develops in your body. By understanding how the process of inflammation develops in your body, especially at the cellular level, we are able to "reverse engineer" the process and design effective wellness strategies and solutions that address inflammation before it triggers a major health problem and causes major damage to your cells and tissues. FYI: Specific wellness strategies and solutions are addressed in our books such as the Death to Diabetes book, Power of Juicing book, DTD Cleanse & Detox book, Death to Obesity book, and Death to Cancer book. Wellness strategies and solutions are also addressed in our DTD Online Training for clients, health coaches, and other healthcare professionals. Despite popular belief, less than five percent of most chronic diseases is solely genetic (in the sense of being directly inherited by family members). 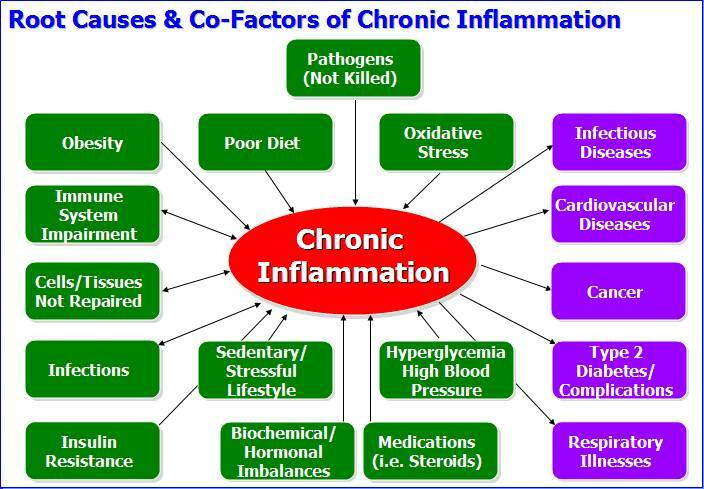 Most chronic diseases have a cause and those causes bring about chronic inflammation as part of the process. New research suggests an emerging link between infection, epigenetics and chronic diseases. Many chronic diseases are linked to viruses or bacteria that promote reversible, epigenetic changes in the body's cells. At minimum, 20 percent or more of chronic diseases are linked to infectious disease. We are thought to only have fully recognized about 13% of infections worldwide, making infection a bigger contributor than typically reported. These infections bring about changes and chronic inflammation as well. One thing anyone with chronic inflammation will tell you is that it causes heat. Abnormal body heat can also lead to thermogenesis and enhance metabolic spread of most chronic diseases. Inflammation is known to cause other such changes in the microenvironment of cells. Cells often undergo adaptive changes to survive stressful or toxic environments. These adaptive changes can include: an increased expression of antioxidant enzymes; increased anaerobic respiration; and development of angiogenic factors. This adaptation is usually transient, however, and allows normal cells to survive only until the toxic condition is alleviated. That means it's not enough to have a strategy to control the disease – chronic inflammation needs to be blocked and stopped at its roots to prevent the disease from spreading. There are multiple ways, but one of the most common is when there is an injury to a group of cells or tissues that need to be repaired. The immune system recognizes and triggers a cascade of signals and inflammation markers that initiate the cellular repair process. 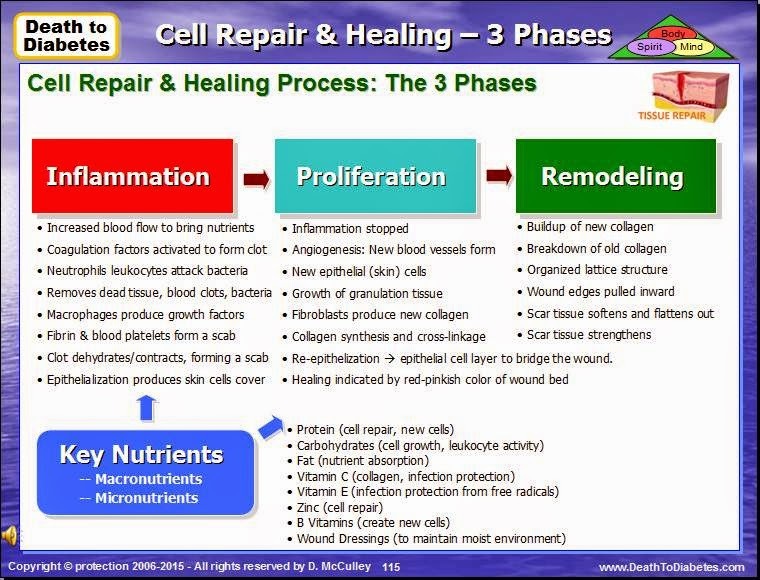 Below is a flow diagram that depicts the 3 phases of the body's cellular repair process. 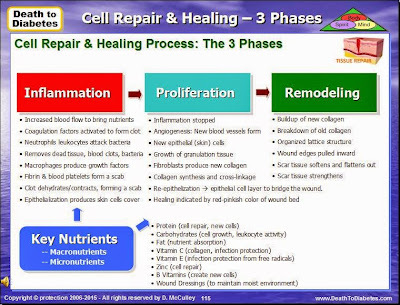 This process works great, but, if, for some reason, the cells/tissues cannot be repaired, the inflammation phase make continue, trying to repair the damaged cells/tissues. This may not seem like a big problem, but, if this type of inflammation goes unchecked for several years, this can lead to diseases such as Type 2 diabetes, heart disease and cancer. Treating inflammation is only one part of a complete treatment plan – there are many other aspects to consider, including nutrition, building the immune system, targeting supplemental therapy and much more. However, if you can slow down the disease's progress, it makes it much easier to maintain and hopefully, overcome. Otherwise, if the disease continues to progress, the body can outgrow any treatment. It becomes a race to slow down the metabolic growth and spread of the disease enough for other therapies to do their job effectively. The best part about these nutritional therapies and other treatment strategies is they are helpful for most, if not all diseases. Note: If you have any questions about your health, or would like to know more about natural treatment strategies, feel free to contact our office; or, get the author's Death to Diabetes book, Power of Juicing book, DTD Cleanse & Detox book, Death to Obesity book, Death to Cancer book, Death to Heart Disease or one of the other books in the DTD Online Store to get rid of your inflammation.